In 108 CE, the Roman Emperor Trajan built two lighthouses at Centumcellae, now Civitavecchia, a city about 50 km (30 mi) northwest of Rome. In 1616, Pope Pius V built a new lighthouse on the foundation of one of the Roman towers, and in 1860 Pope Leo IX had a second-order lantern installed on the tower. Huelse has a postcard view of the lighthouse, which was 32 m (105 ft) tall. The lighthouse was destroyed during World War II. After the war, a 20 m (66 ft) round stone tower was built as a historic landmark on the modern breakwater, about 600 m (3/8 mi) northwest of the old lighthouse. However, this "replica" does not resemble the original and is at best a faux lighthouse. 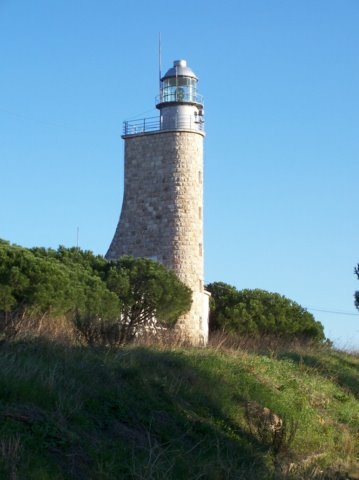 The ruins of the historic lighthouse are located on a short abandoned mole on the old waterfront of Civitavecchia.